By Sia in Desktop. Updated on July 6, 2017 . Ransomware has gained a huge amount of notoriety as of late thanks to two major outbreaks that occurred rather recently. The first is the infamous WannaCry ransomware that made the news when it was spread to the UK’s National Health Service (NHS) system. The second is the NoPetya ransomware that targeted systems and computers across Europe. With these two large scale ransomware attacks, it is understandable that some people are wondering if their computers are susceptible to being held hostage by digital kidnappers. Elad Erez developed an easy-to-use scanner that lets users detect whether or not the computers on their network are safe from ransomware. 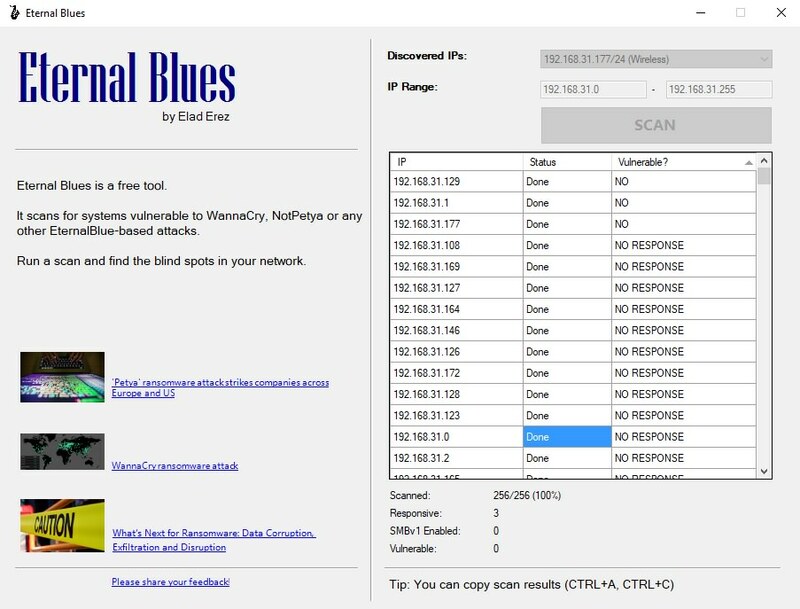 Meet Eternal Blues, an app named after the EternalBlue network infection vector that is used by the ransomwares mentioned above. 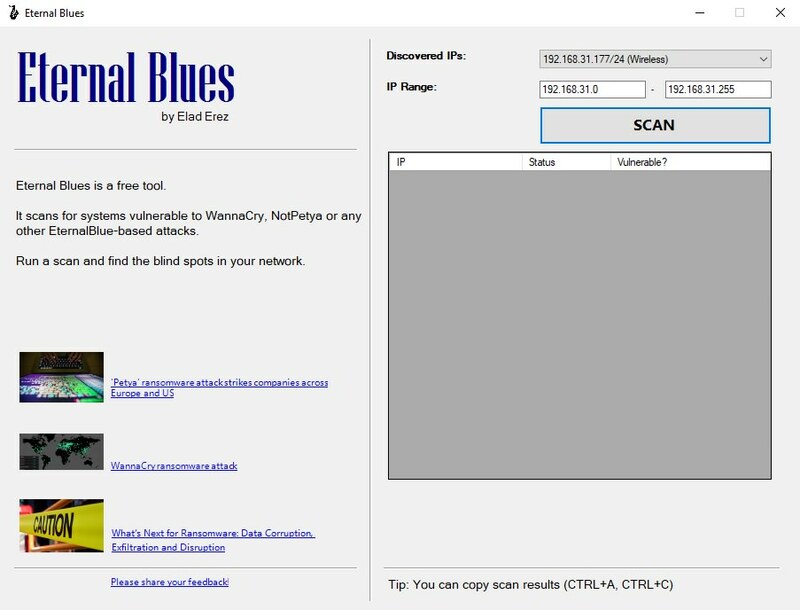 Unlike some of the more complex vulnerability scanners available for use, operating Eternal Blue is simply a matter of clicking the Scan button and waiting for it to be done. Once the scan is complete, it would list down the vulnerability statuses of all connected devices on the network. Devices that are secure and not vulnerable will be labelled as "No", while those that are will be highlighted with a "Yes". Meanwhile, inactive connections will be given a "No Response" label. When devices is labelled "Yes".. So what do you do if your device is labelled vulnerable by the scanner? Well, the simplest way to fix the problem is to make sure your Windows operating system is up-to-date. When the ransomware outbreak occurred, Microsoft pushed out a large number of patches for its OS that covers Windows versions as old as XP. In short, if your device is running on Windows XP or later, the Windows Update program may have the patch you need to protect you from ransomware.